You are currently browsing the tag archive for the ‘transition towns’ tag. This week sees the launch of the UK’s first ever urban local currency: the Brixton Pound. As the local Lambeth think-tank, nef is supporting the scheme, which the organisers hope will keep Brixton a diverse retail environment, full of independent shops, traders and craftspeople, as well as cutting carbon emissions by encouraging locally sourced goods and services. The B£ will be first spent in the Dogstar, Coldharbour Lane, Brixton, on Thursday evening, after a launch event in Lambeth Town Hall, with speeches from Transition Movement founder Rob Hopkins, Lambeth Council’s CEO Derrick Anderson, and nef‘s own David Boyle, co-author of the forthcoming book The New Economics. nef is now over halfway through its Hay Festival series, sponsored by the Ecology Building Society. We had a great event yesterday with the founder of the Transition Movement, Rob Hopkins, spoke to London Food tsar Rosie Boycott about making the shift to low-carbon, resilient economies. The Guardian’s Alastair Harper has done a very thorough write up as part of the paper’s ongoing coverage of Hay happenings. If you’re planning to head over to Hay for the weekend, don’t forget you can still catch nef‘s events on the Green New Deal and the Environmental War Economy. Sometimes, it seems, wishes do come true. I spent much of last week designing graphics for some spoof newspapers which our Participation and Democracy team are creating to engage people in discussions about climate change. There are four different papers, all set in 2027 but each with a different climate change outcome, ranging from a sustainable future to a veritable apocalypse. 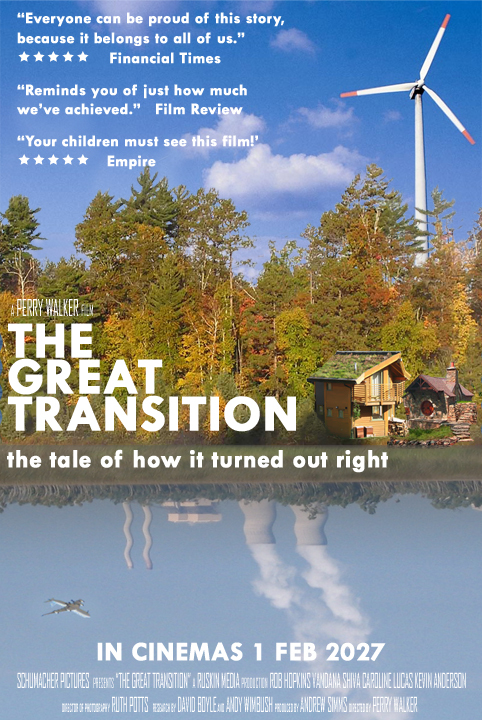 I’d been asked to make a suitable film advert for each scenario and decided that a documentary called The Great Transition: The tale of how it turned out right was a good fit for the sustainable future paper. As I emailed the finished image to my colleagues, I wrote ‘I really hope they get a chance to make this one’. We’re pretty enthusiastic about alternative currencies at nef. We have a ‘funny money’ wall decorated with Berkshares, Totnes Pounds, Lewes Pounds and Time Bank dollars. Since these notes are only accepted by small local businesses, they keep money circulating in their respective local economies, rather than being leaked out out the area through chain stores. Local currencies help to create thriving communities, and help keep our high streets from turning into Clone Towns. So we’re pleased to report that a new community currency will soon be circulating not far from nef headquarters. A few enterprising souls at Transition Town Brixton are introducing their very own pound this September, and have a new website to promote it. Members of nef‘s Connected Economies team have acted as advisors on the project and Lambeth Savings & Credit Union (LSCU), a financial co-operative that has been serving Lambeth since 2006, are holding the Brixton Pound’s sterling backing. Stopping the spread of Clone Town syndrome is particularly crucial for Brixton. It has plenty of independent retailers, but these are under threat from aggressive chain store expansion. Tesco already has a huge superstore just off the High Street and a Tesco Metro on the road up to Kennington, and yet it still has plans for expansion in Brixton, draining more customers away from local businesses. Earlier this year, Brixton’s vibrant market only narrowly avoided being turned into a yet another dull shopping precinct. Thanks to campaigning by Friends of Brixton Market, the planning application from developers London and Associated Properties (LAP) was rejected. Initiatives like the Brixton Pound will help to make this victory secure. If you live in Lambeth – or even if you don’t – and want to support the scheme, you can pledge to buy ten Brixton Pounds (B£10) when the scheme goes live in September. Or, if you’re a business owner in Brixton, you can pledge to accept the currency from your customers. And while I’ve got the attention of all you South Londoners, why not join Project Dirt?